If you’re shopping for an engagement ring this year, you may want to research the current trends on offer. While some styles of engagement rings remain timelessly popular, there’s always new trends emerging year upon year. Here, we’ll look at some of the most popular engagement ring trends for 2018. One of the biggest trends this year has been the switch to non-traditional rings. This includes opting for a non-traditional stone, or a non-traditional cut. Diamonds are still very much in demand, but other, more coloured stones are also starting to become extremely popular. Take a look at clusters, mixed metal and double band rings for inspiration. Engagement rings may be most associated with women, but they’re starting to become popular for men too. Ed Sheeran has helped to push the male engagement ring trend this year, after he was spotted wearing his at the Brit awards. More men are coming around to the idea of wearing an engagement ring. So, why not make your engagement extra-special this year and invest in his and hers engagement rings? 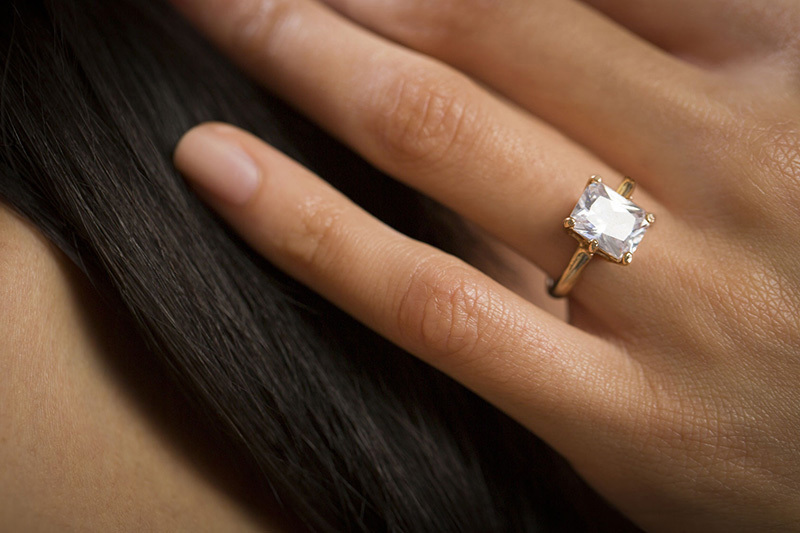 Engagement rings come in a wide range of designs and gold used to be the metal of choice. However, there’s been a huge shift to less traditional metals, including white gold and platinum. Platinum engagement rings are considered one of the highest-quality and most beautiful choices. They are more expensive than the traditional gold ring, but they offer a unique, stunning and sparkling design. Platinum rings are unique and beautiful just like your relationship. It was actually Meghan Markle who made this trend go viral. After getting engaged to Prince Harry, a lot of attention was given to the princesses stunning three stone ring. While hers is undoubtedly more expensive than most of us can afford, there are some affordable three stone rings available on the market. They’re unique, provide extra sparkle and they can even be used to signify your past, present and future together as a couple. The stackable engagement rings started to become popular last year, and they’ve managed to retain their popularity in 2018. Allowing you to customise your look, you can use two, three or even four rings stacked on top of one another. If you wanted to make it extra-special, you could use one ring to symbolise each milestone in your relationship. Of course, not everyone has the budget for stackable engagement rings! However, if you’re looking to go all out to impress her, a stack of rings is sure to do it. If you do decide on this option, you’ll need to make sure the rings you buy go well together. These are some of the most popular engagement ring trends of 2018. You don’t need to follow them, but if she considers herself a bit of a trend setter then you’ll definitely want to consider investing in the latest trends. Now you’ve found the right ring, all that’s left to do is come up with the perfect proposal.